OPI Coca Cola swatches! Yay! And guess what! I’m not even going to say anything… much. 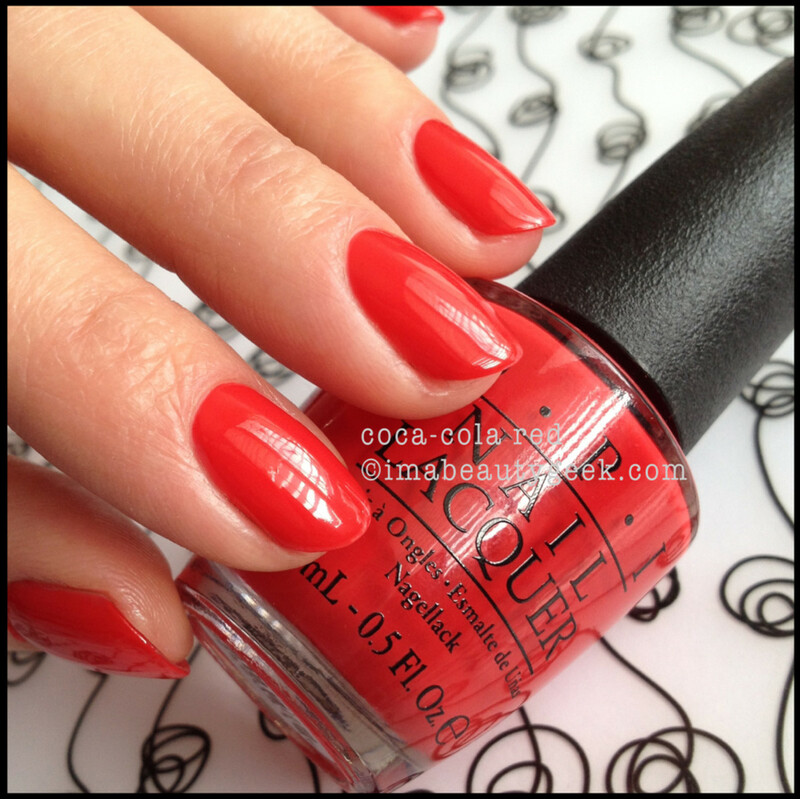 OPI Coca-Cola You’re so Vain-illa: This formula was pretty okay! The shade itself is not really for me but maybe it’s for you? Apparently, it’s inspired by Vanilla Coke. Hmm. OPI Coca-Cola Sorry I’m Fizzy Today: A pretty Cherry Coke-inspired corally/peachy/pink. I don&apos;t see anything particularly fizzy but it&apos;s pretty so there&apos;s that. OPI Coca-Cola A Grape Affair: A 100% dupe for OPI Vant to Bite My Neck? Inspired by Fanta Grape. OPI Coca-Cola Today I Accomplished Zero: Yes. It’s Coke Zero and it looks like Coke Zero. I slapped one coat of the stuff over OPI A Grape Affair to get what you see there. 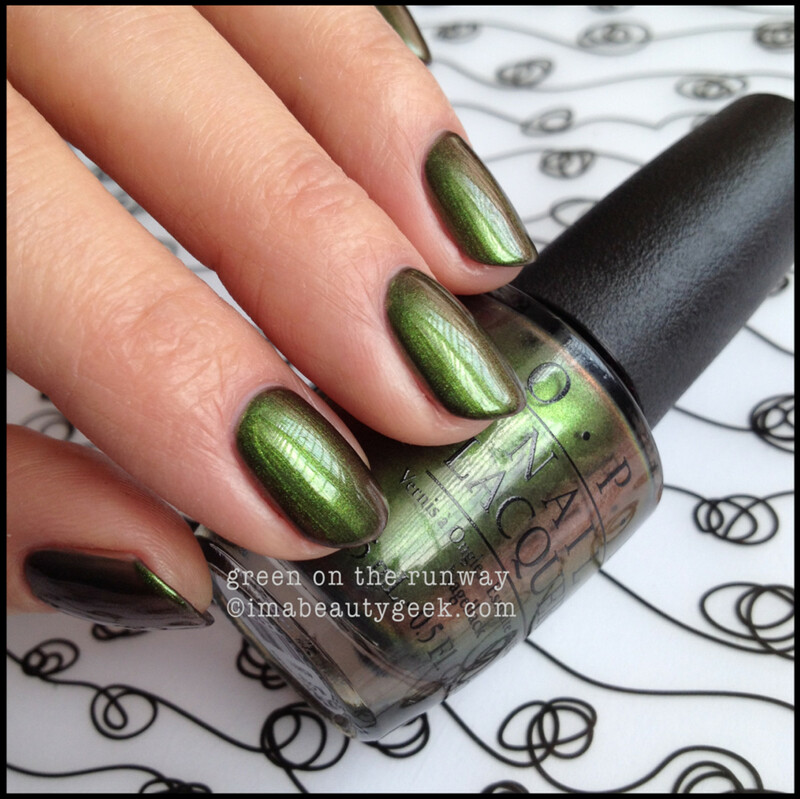 OPI Coca-Cola Green on the Runway: Huh. Inspired by Sprite? What? There’s no red on a Sprite can is there? Regardless, it’s a duochrome and you all know how I love a duochrome! 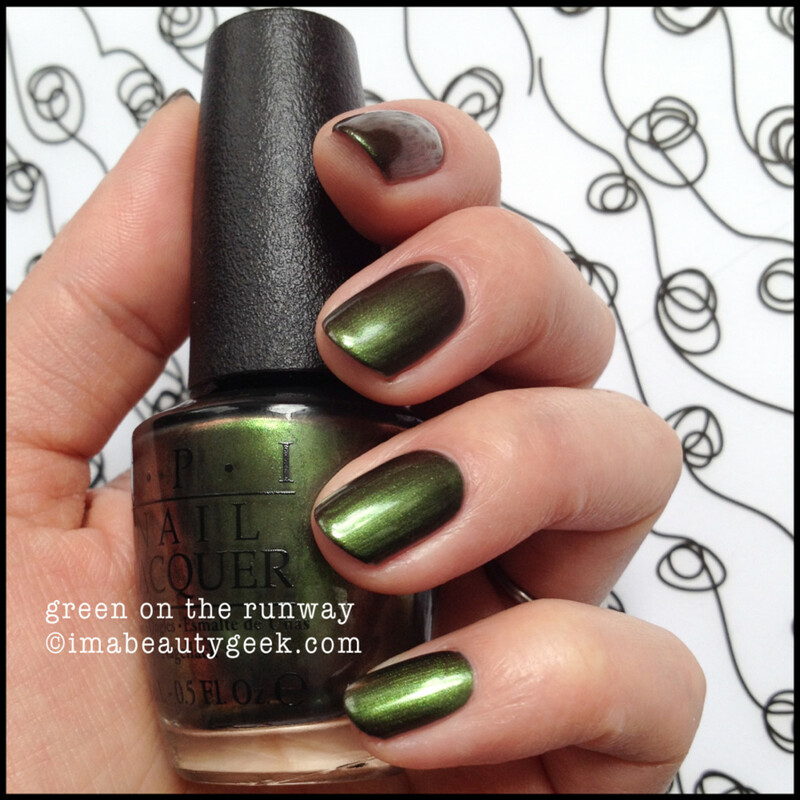 OPI Coca-Cola Green on the Runway: Shifty, shifty, shifty! OPI Coca-Cola Green on the Runway: One last shot of the duo just because I can. OPI Coca-Cola My Signature is “DC”: Sparkly, frosty silver inspired by Diet Coke. You’re thinking OPI Haven’t the Foggiest – think brighter, and you end up with this. It’s not a dupe. Nope. OPI Coca-Cola Orange You Fanastic! over OPI A Roll in the Hague & OPI Coca-Cola Red (middle finger only): You’re looking at a single coat of Orange You Fantastic! over top of those shades. 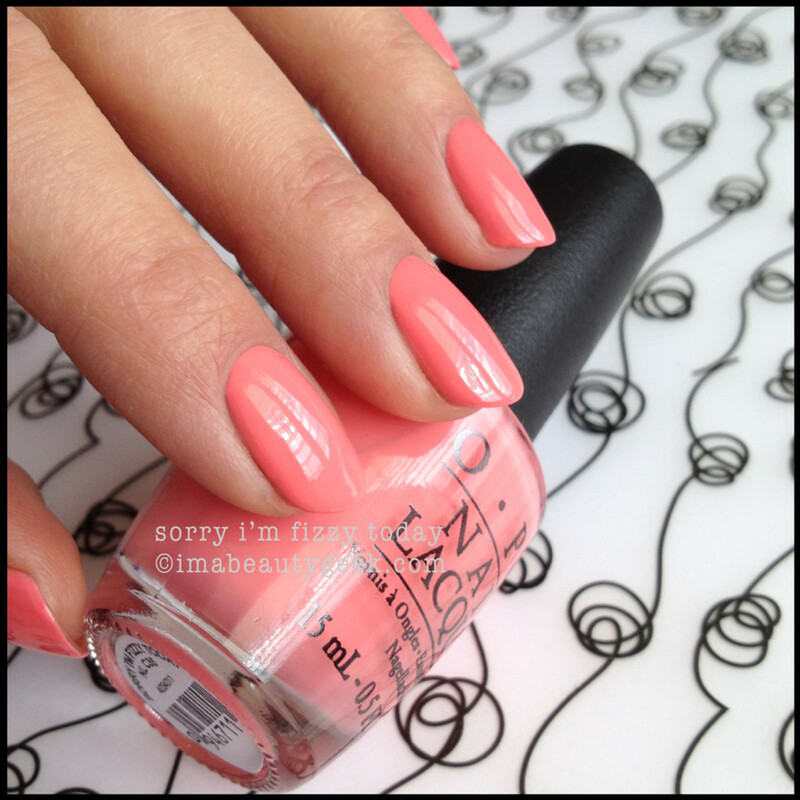 OPI Coca-Cola Orange You Fanastic! over OPI A Roll in the Hague & OPI Coca-Cola Red. It’s very reminiscent of OPI Muppets World Tour – it’s got those little sandy bits in it that make it a really special kind of glitter coat. It looks totally different when it’s dry so when you put it on and it looks kinda weird, just wait and don’t top coat, okay? OPI Coca-Cola Red: That right there is a OCW!!! * I don’t have a red like it and I don’t have a can of Coke so I can’t even tell you if it matches or not. I’m the worst Mani-Geek ever. 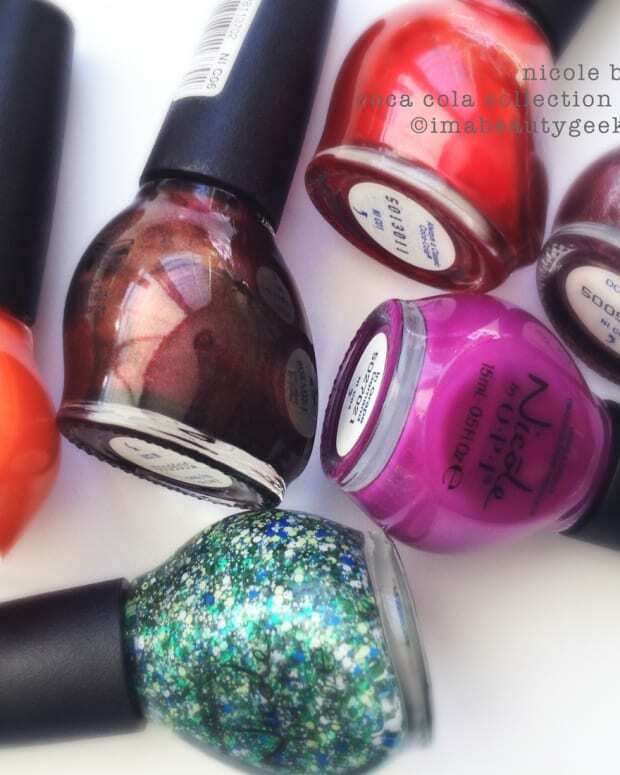 OPI Coca-Cola 2014 Swatch Wheel so you can see Orange You Fantastic! (#7) without a base color. As always, clicking zooms. *By Reader Request for Crystal: An Quick OPI You&apos;re So Vain-Illa Comparison Swatch. #8 OPI My Vampire is Buff, #9 OPI You&apos;re So Vain-illa, and #10 Essie Urban Jungle. Ask and if I have &apos;em, you shall receive! Hope it helps! I got Game of Thrones to watch with Nick (he’s so patient sitting over there waiting for me) so I’ll quickly let you know that everything you see here is two coats (except for OPI Coca-Cola Red and OPI Orange You Fantastic!). The stuff all goes on nicely and evenly – it’s always such a treat to use an OPI collection like this. Their product is so solid. So consistent. So good. If you’ve got questions, ask away. If you’ve got comments, you KNOW I wanna hear ’em! Coca-Cola by OPI will be available in both nail lacquer ($10.95 CAD) and GelColor (professional salon use only) formulas beginning June 2014. 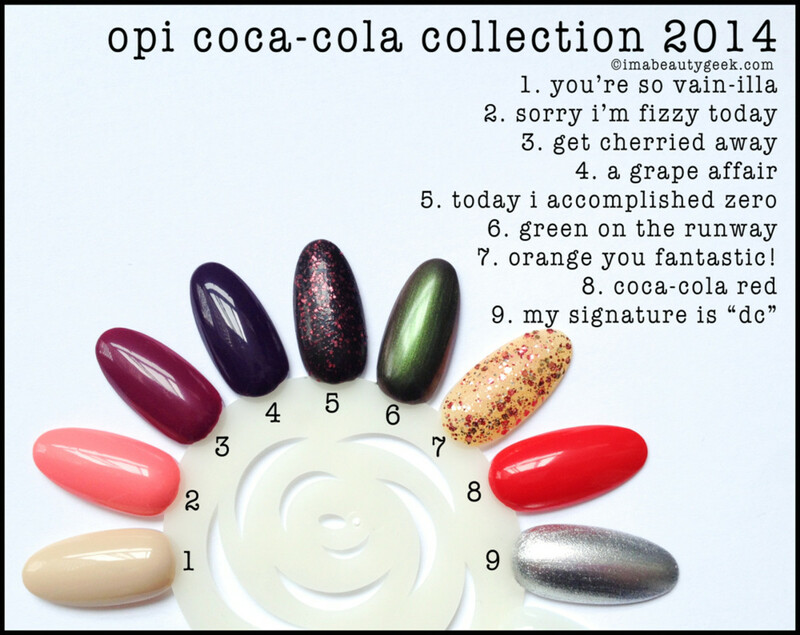 There’s also an OPI Mini Set called the Coca-Cola 10 Pack of Style ($29.95 CAD) – it won’t contain Orange you Fantastic! but it will contain a mini OPI Top Coat & Mini OPI Original Nail Envy. Then there&apos;s also this brilliantOPI limited edition Ford Mustang 2014 Collectionwe swatched for you - it launches June 2014. For more information, visit OPI.com. 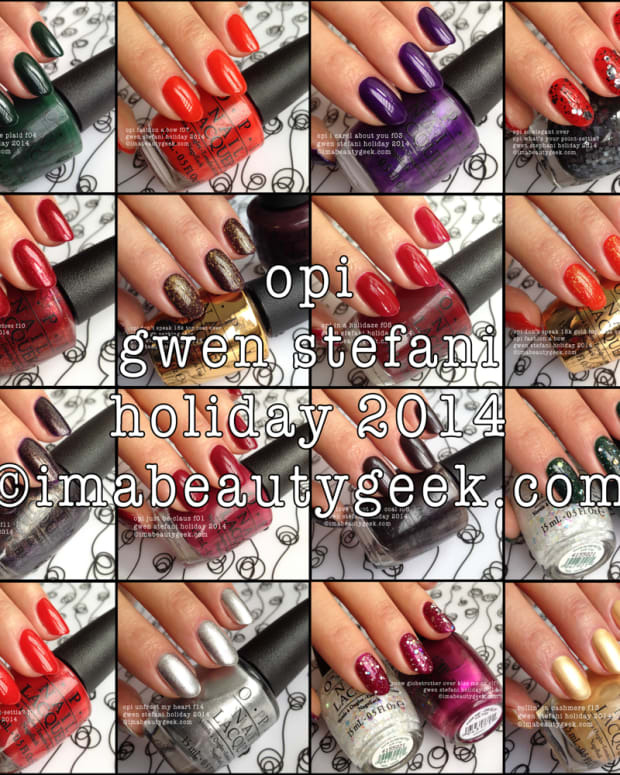 I also made you these nice lazy links for OPI 2014 Neons and OPI Brazil. 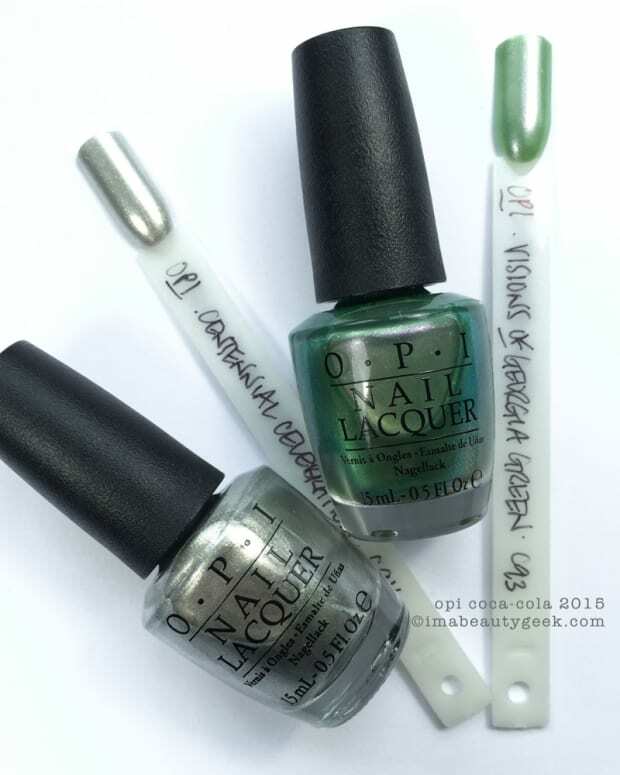 OPI COCA-COLA 2015 SWATCHES & HEY! DON'T STEAL MY STUFF!